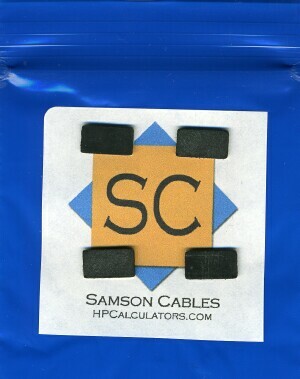 Replacement rubber pads for the HP Voyager calculators (10C, 11C, 12C, 15C, 16C, 28C). This is a full set of four feet for your calculator. These self-adhesive Vintage Voyager Rubber Pads™ have been precision cut for a perfect fit on the HP Voyager series of calculators. As an added bonus, the Vintage Voyager Rubber Pads™ match perfectly the color of the original HP rubber pads. These brand new rubber pads are all one can expect for the beautifully crafted Voyager series of calculators. Not only are these pads cut from the highest quality rubber, but they specifically address the clearance problem of the calculator as well. By adding less than one millimeter extra thickness, your HP Voyager calculator retains its low profile. However, the additional clearance afforded by the Vintage Voyager Rubber Pads™ allow you to use your calculator without the fear of reducing its value due to contact with the surface upon which it rests. In addition, the calculator still fits easily into its vinyl slip case.